I'm a less than confident fish cooker. I fear accidentally serving sushi to my family. I don't always know what flavors really goes with what and I am afraid of the bones. There, I own all of it. But I'm getting better and I'm trying new things. Phew - that weight off my chest is freeing. Anyway, our Whole Foods had a sale and I'm excited about bargain food! I didn't know what I was going to do with these salmon filets, but I knew I needed them. Digging around the Internets I found this Martha Stewart recipe and decided to try it. We all really liked it and it will be in our regular rotation. In a small bowl mix together sugar, olive oil, soy sauce, lemon juice and wine. 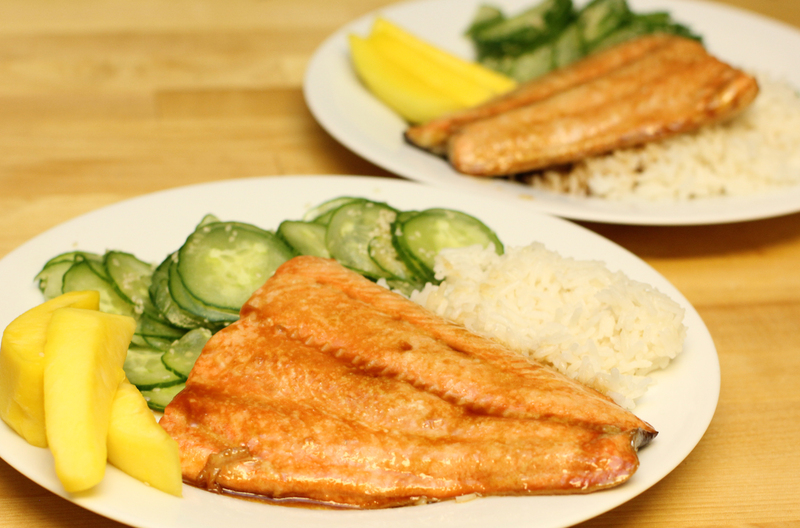 In a shallow baking dish arrange salmon filets so they fit without overlapping. Pour the marinade over the filets and then flip to coat all sides. If you're using filets with the skin on, bake skin side down. Bake about 20 minutes, depending on how big your filets are. Baste twice while baking. We ate this with cucumber salad, mango slices and coconut rice. This was a really easy weekday meal. The salmon was perfect - light, flavorful and a new option for us.